For info on volunteering with or donating to Veterans Healing Farm, visit www.veteranshealingfarm.org. Outside the entrance of Asheville’s VA Medical Center on Tuesday mornings during growing season, you may be surprised to discover a bountiful harvest. 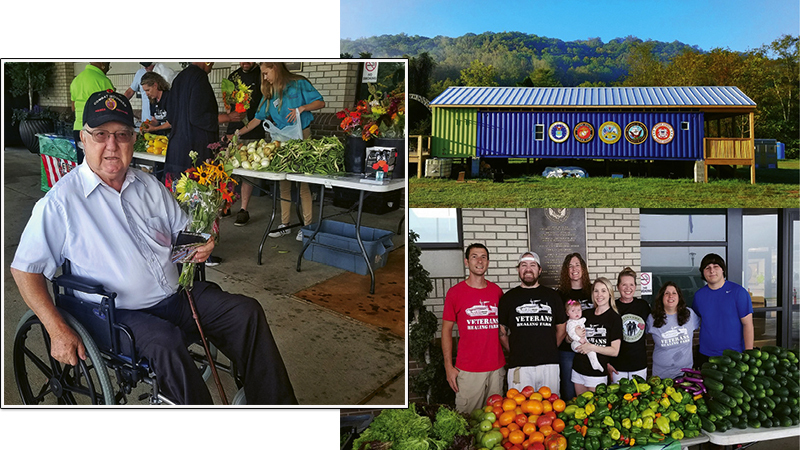 Volunteers from Veterans Healing Farm, many of them veterans themselves, arrive before 8 a.m. to set up tables of fruits, vegetables, and flower bouquets, all grown on the Hendersonville farm. Scores of former service members and their families come by to share stories and build community, then take home boxes of healthy produce, free of charge. Although agriculture is a key component of Veterans Healing Farm, it isn’t the main focus. Rather, healing is, says farm director and Air Force veteran John Mahshie. According to the Veterans Administration, about 20 veterans commit suicide every day. Mahshie launched the nonprofit in 2014, but the idea came to him years earlier as he pondered how to prevent suicides among people transitioning from military to civilian life. At the farm, veterans’ stress-reducing activities can take the form of planting a seed, equine therapy, or brushing a rabbit’s fur. “We try to find things that people can begin to become excited about again,” Mahshie says. “What happens is that that excitement, that little spark, when you feed it, eventually it can build into a roaring blaze.” Camaraderie is fostered at potlucks, boot camps, and workshops on such skills as chicken harvesting and beekeeping.